July 20, 2018, 2:00 p.m. In fact, 58% of Republicans claim that the Federal Bureau of Investigation is attempting to frame the President. There is little change in these results from polls conducted before the indictments. There are several reasons for Republicans dislike for the investigation and its leader, Special Counsel Mueller. One is how they view Mueller himself. Although somewhat more approve than disapprove of how Mueller is handling the investigation (37% approve, 30% disapprove), Republicans disapprove by more than two to one (43% to 17%). However, four in ten Republicans give no opinion on this question. Half of Republicans hold a generally unfavorable opinion of the Special Counsel, and only 17% of Republicans are favorable towards him. But another reason for the GOP reaction is Republican rejection of the basis for the inquiry. They do not believe that the Russians hacked the emails of the Democratic National Committee in 2016 to help President Trump win the election, and they doubt that it created and spread fake news for the same purpose. There was not much difference between Republicans who had heard a lot about the indictments and those who have heard little on whether or not they believe that Russia was involved. There is, however, a difference based on whether or not Republicans are concerned about possible Russian influence on the election. 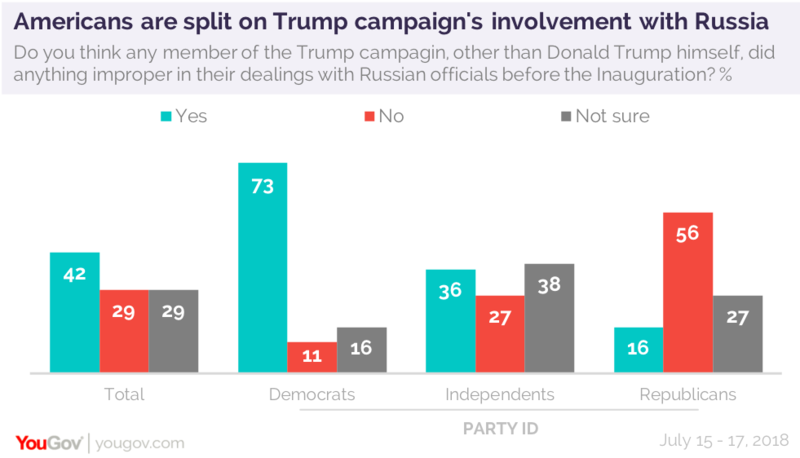 More Republicans say they are not concerned about improper relations between the Trump campaign and Russia than say they have any concern at all. The opposite is the case for the public as a whole. Republicans are generally less worried about Russia in general: nearly as many describe the country as either a minor threat to the United States or no threat at all as think it is a serious threat. 59% of the public overall sees Russia as a serious threat, and only 25% disagree. Those Republicans who express concern about possible improper relations between the Trump campaign and Russia are more likely to believe that Russians were involved: half in this group say Russia spread fake news to help the Trump campaign, nearly as many say the country was involved in hacking the DNC’s server and stealing emails.